I don't review many everyday table wines here on the Blog Wine Cellar, but it's not because I think I'm somehow too good for a bottle of wine under ten dollars. In fact I enjoy drinking quality wines in a lower price tear because I feel that there is something special about the wine being the compliment to the meal or the dinner table and not so much the wine always being the main center piece. 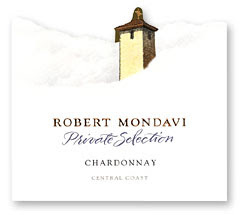 The Private Selection Chardonnay from Mondavi is primarily sourced from graped grown in California's Central coast. I do know that although it's a very large production that they do partially barrel ferment this wine and the rest goes through stainless steel. On the nose I get lemon pudding, lots of buttery oak, and even a touch of banana peel. It actually has a pretty nice aroma complex that isn't always available in cheaper Chardonnay. It's a bit too oaky for my liking and I tend to gravitate to Central Coast Chard that is on the crisper and fruit driven side.